Sneezin’s Greetings! Its release day! I am showcasing some more new products today. First up is Spring Grumplings stamp set and dies. I love the grumplings series. If you already don’t know, Taylored Expressions has this Grumplings series of stamp set and dies which are just fantastic with hilarious sentiment. They are my favourite series. Check them out. The Spring Grumplings are no better. I love playing with these grumplings. Makes me so happy. I combined Spring Grumplings stamp set with the new Spring Florals stamp set and coordinating dies to make my card. 1. Card base is made of Granny Smith cardstock and stamped on with foliage and dots stamps from Spring Floral stamp set and Granny Smith TE dye ink. 2. I then die cut a round card base using the largest stitched circle die and Lavender Glaze cardstock. I adhered this on the centre of the card front. 3. I stamped the Spring Grumpling image on watercolour paper using Oreo Hybrid ink and coloured with Zig Clean Brush Pens. Then die cut the image out using the coordinating die. 4. I stamped the wreath, foliage and flowers from Spring Florals stamp set using Granny Smith, Sprinkles, Strawberry Milkshake and Lemon Meringue TE dye inks. Then die cut them all out using the coordinating dies. 5. The sentiment from Spring Grumplings stamp set is white heat embossed on a strip of Oreo cardstock and trimmed with fishtail ends. 6. I adhered the wreath on the stitched circle card front using foam adhesives, then the grumpling image on the top left of the wreath with the flower and leave cluster on the bottom right of the wreath. I tucked in the sentiment below the grumpling image. 7. I brush wink of stella on the flowers and added TE enamel shapes on the flower centres. 8. I also stamped another sentiment from Simply Said Spring on the inside of the circle card. Here are the closeup of the card. 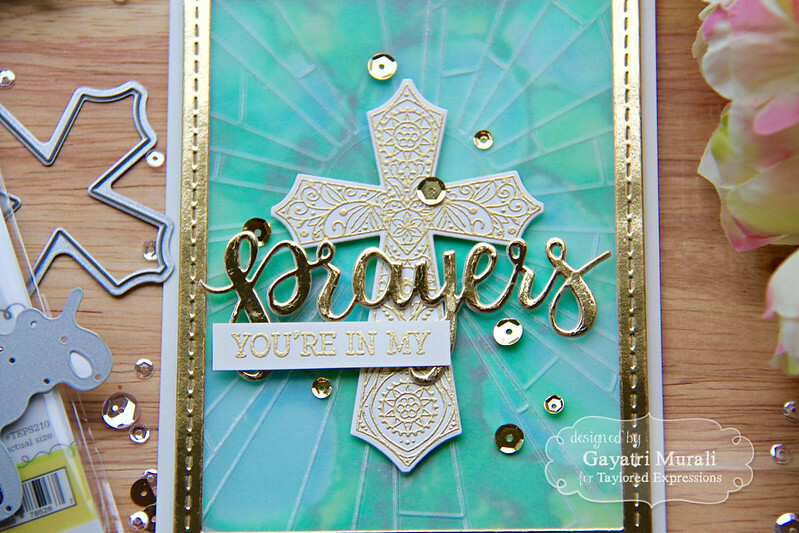 The second project I am showcasing today is an embossing folder called Redeemer. 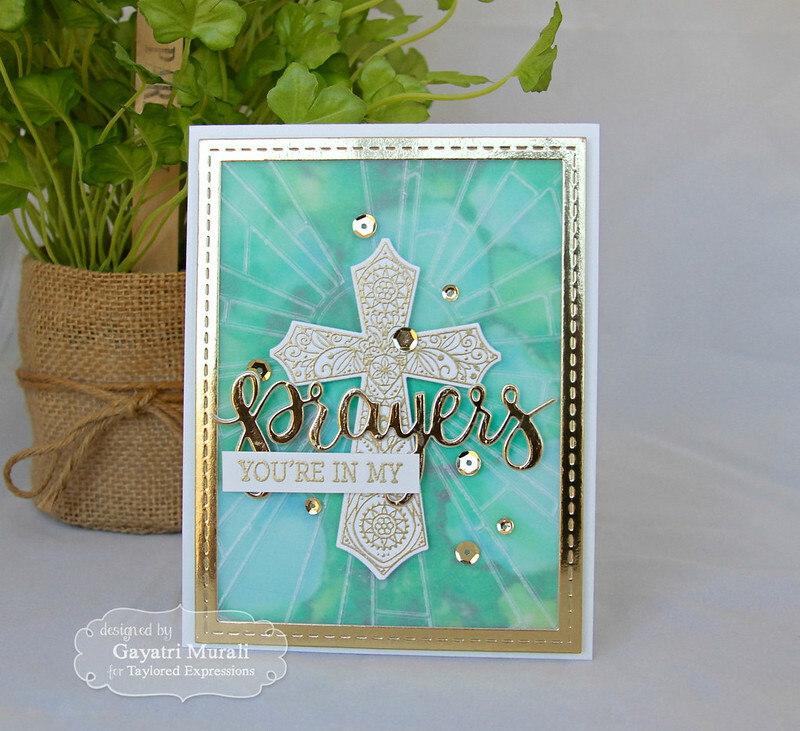 I love this embossing folder and perfect to create stained glass effect. 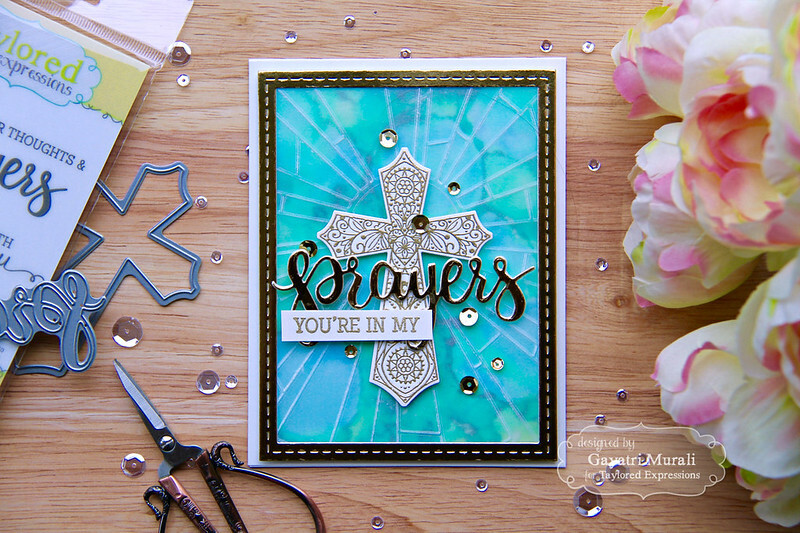 I combined this embossing folder with the new My Redeemer Lives stamp set, coordinating dies, Prayers Script die and You’re in My Prayers stamp set to make my card. 2. I used an acetate sheet and a few copic refills in blues and greens to create a stained glass like background. The colours are really bright and bold. 3. I die cut a frame using the largest frame die from Stitched Frame Stacklet and gold mirror cardstock. 4. I embossed vellum using the Redeemer embossing folder. 5. I adhered the gold frame on the vellum embossed panel and them on the stained glass acetate sheet. The vellum panel softens the bright and bold acetate panel and makes it look beautiful. 6. 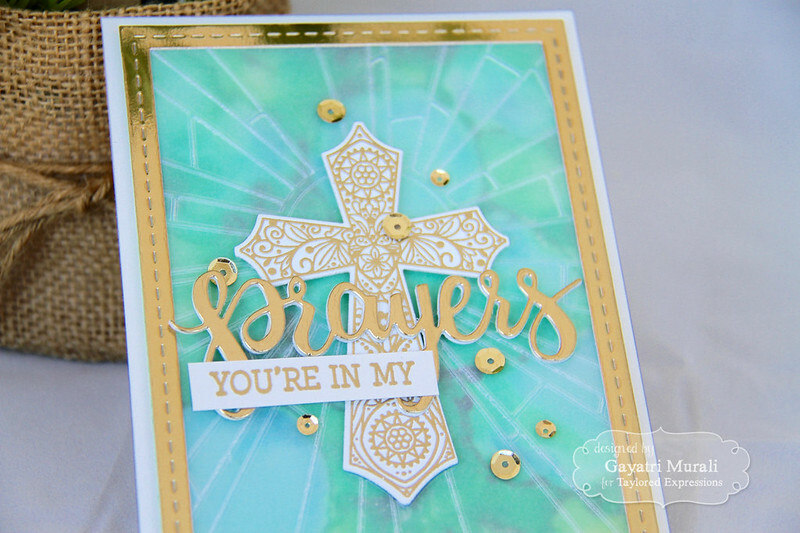 For the focal point, I gold heat embossed the cross from My Redeemer Lives stamp set and die cut using the coordinating die. I adhered this die on the centre of the vellum panel. 7. For the sentiment, I die cut Prayers Script die using gold mirror cardstock and gold heat embossed the smaller sentiment on a strip of white cardstock from the You’re in My Prayers stamp set. Both are adhered over the cross as shown. 8. The entire panel is adhered on to the card front using foam adhesives and embellished with gold sequins. Hope you are inspired by my projects. Check out Taylored Expressions Blog for more details. All the new release stamp sets and dies are now available for purchase at Taylored Expressions Store. Happy Shopping and thanks for visiting my blog.